It was still dark when I got up and went down to the lakeshore for the sunrise. The sky was cloudless and the rays from the sun which was still below the horizon lit up the eastern sky a beautiful golden color . 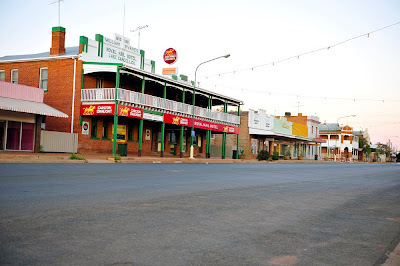 Once the sun was up, I returned to the caravan via the main street, (one block long), which was deserted except for a person in a wheelchair on the footpath. Today was our washing day and Coba was up and ready to get a washing machine before others arrived and claimed them. We were lucky, no one else had made it to the laundry so we had first pick of the machines. While Coba stood guard over the washing, I drove around to the other side of the lake to a place called Curlew Waters. My main interest was in birds but the only birds that I saw were either flying over or flying away. After lunch we bought in the washing and headed to the weir which was the entrance to the lake system from the Lachlan River. When the Lachlan is in flood they open the gate and allow the water to enter the lake system and when the river is ready to start dropping they shut the large weir gate that retains the water in the lakes. The Australian Shellducks were still in the top shallow lake (Sheet of Water) but were very timid. There was no way we could get close to them and there was no cover to sneak up on them. At the weir we watched Welcome Swallows feed their young as they flew past them. I was also lucky enough to photograph Chestnut Rumped Thornbills that were in a tree beside the lake. Except for this it was a poor day for bird photography. As we came back towards town, we came across a modern day “Swagman”. He no longer carried his “Bluey” on his back but this chap had set himself up with a horse and cart. The cart had four rubber tyre wheels and the shaves were made of water pipe. The hard wooden seat that would normally be covered by a chaff bag had been replaced with a pair of bucket car seats. The seat belts were missing. The swag (Bluey) was in the back next to an esky. I guess this can only be classed as progress and also a way to beat fuel costs. It was time for us to leave Lake Cargelligo and move on. With the caravan in tow, we headed for Rankins Springs on the Western Highway that links Sydney to Adelaide. It also links the Stuart and Newell Highways, We stopped at a bird observation point along the way but there was nothing there. It was then on to Hay where we fuelled up and purchased some supplies avoiding fruit which we would have to hand in at the check stations. The countryside was green with plenty of grass from the recent rains that had broke the drought. This has bought another problem with large numbers of Grasshoppers, or Locust as they are also known, hatching and covering the ground. They are now on the wing and flying and we ran into large swarms of these insects. The car was splattered with these grasshoppers so much so that we had to clean the windscreen so we could see out of it. Leaving Hay we passed large sheets of water on the country side from the rains. Wild ducks were plentiful at these patches of water. Soon after we hit the swarms of Locust again and by the time we reached Balranald we had to stop and clean the windscreen so we could see. By now the car was starting to smell from the splattered bodies of these insects. Our camping-site book told us of a campsite on the shore of Lake Benanee near Euston so we set this as out place to stop for the night and a good choice it was.